CHICAGO (KGO) -- The Cubs are finally World Series champions and the city celebrated their victory with a North Side parade and rally in Grant Park. Maddon started by talking to the fans, saying "You guys are the best. Congratulations!" Cubs President of Baseball Operations Theo Epstein also spoke, telling fans that they "are really what carried our guys through October." He said the players "felt how badly" the Chicago Cubs fans wanted a World Series win. Cubs owner Tom Ricketts told the crowd that the players on the World Series team are "going to be Chicago baseball legends." Ricketts said he was used to fans coming up to him, asking when the Cubs were going to win a World Series. He said, "For the thousands of people who have said that to me, 'There you go.'" Tens of thousands of fans waited at Grant Park for the rally. 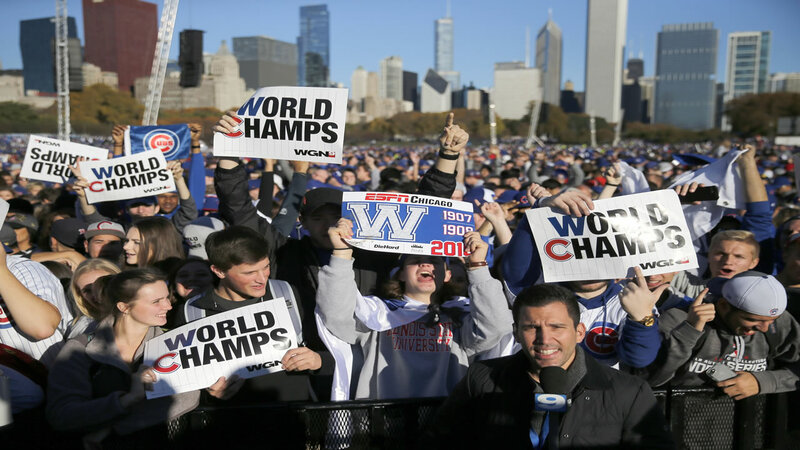 Many waved white and blue "W'' for win Cubs flags and held signs saying "World Champs." Tens of thousands of fans lined city streets Friday, waving Cubs "W'' victory flags and shouting, "Let's go Cubs," as the buses went past. Players hoisted the Commissioner's Trophy as a large replica of the trophy went past on the back of a pickup truck. And as Cubs President Theo Epstein's bus drove by, fans yelled "Theo, Theo, Theo." The Cubs mascot, "Clark," cheered at the beginning of the parade from the back of a pickup truck. Center fielder Dexter Fowler had a cigar. The Cubs haven't won a championship since 1908, and some were calling Friday's rally and parade the "celebration of a century." Nine-year-old Juliza Hernandez of Chicago was wearing a Cubs jersey outside Wrigley Field on Friday morning. She made a sign with her father and 6-year-old sister Emily that said, "Winners" and "Go Cubs Go!" Laurie Winter, of South Elgin, woke up at 4 a.m. Friday to bring her 2-year-old son Cooper to the stadium to see the players. The 34-year-old says she spotted a man carrying a sign that said "Tickets wanted for World Series 2017" and that everyone is excited about the team's future. Frank Murtha tells USA Today (http://usat.ly/2f8eNW9 ) that Bartman "was overjoyed that the Cubs won" on Wednesday night to clinch the Series, but that he doesn't "want to be a distraction" to the team's accomplishments. But trains were already skipping stops Thursday morning because they were packed with fans, some draped with the team's blue and white "W'' flags before 7 a.m.
Metra spokesman Michael Gillis said the rail line is "using every piece of equipment" available to accommodate the "huge demand."